My figure painting tends to achieve what some may charitably call 'gaming standard'. It doesn't help that I'm colour blind and can very easily paint something the complete wrong colour. All of my paints are clearly labelled and I tend to avoid mixing whenever possible (I usually can't recreate the colour again...). That said I do enjoy figure painting and find the whole process quite relaxing, particularly if I've had a bit of a day. Sometimes though, Its fun to spend a weekend making and/or painting a bit of terrain. 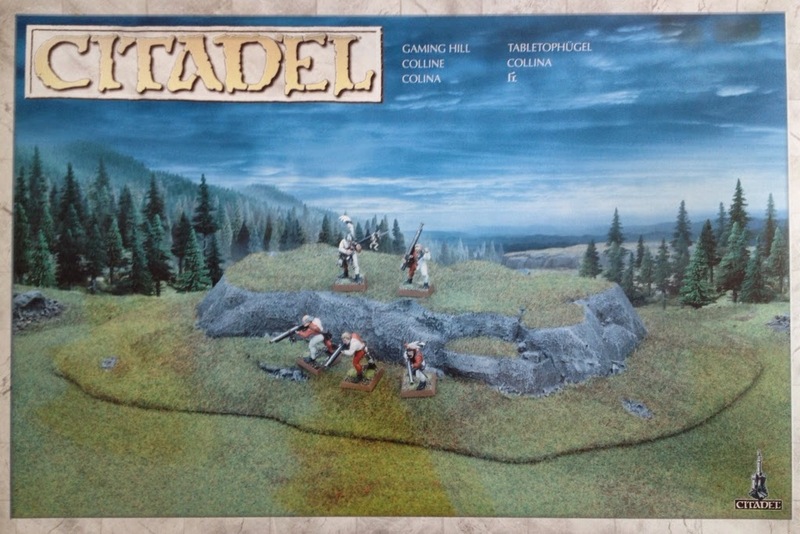 I picked up this now out of production Games Workshop hill a few weeks ago in Herne Bay. It had been sat in the window for months and after seeing how much they go for on eBay (and after a bit of success with a similar modular hill kit last year), I decided to splash out. The shop owner as so relieved that I was prepared to take it off his hands he let me have it for just £12. 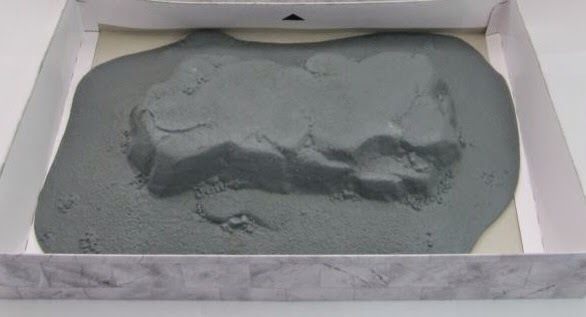 Anyway after buying and undercoating it, the hill remained in its box for a few weeks. But one bank holiday weekend later and it's finished! Sometimes just slapping lots of paint on something big without worrying too much about fine detail can be quite satisfying. 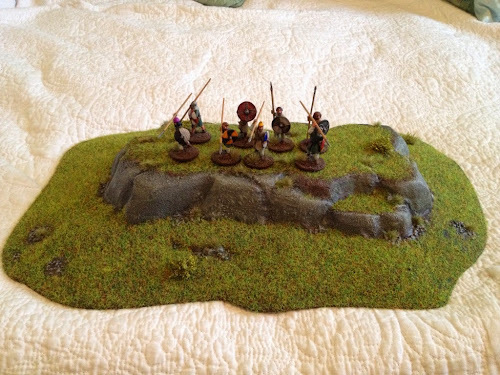 Terrain can be designed to be very abstract and work really well when positioning figures during a game. Perhaps just a piece of green felt to represent a wood. It can also be made very realistic, look great in a diorama but not work so well in an actual game. I therefore try to achieve a middle ground, realistic looking scenery that doesn't have too much fuss to get in the way of positioning troops. You will notice that the hill is not empty, it is occupied by a band of spear wielding warriors. 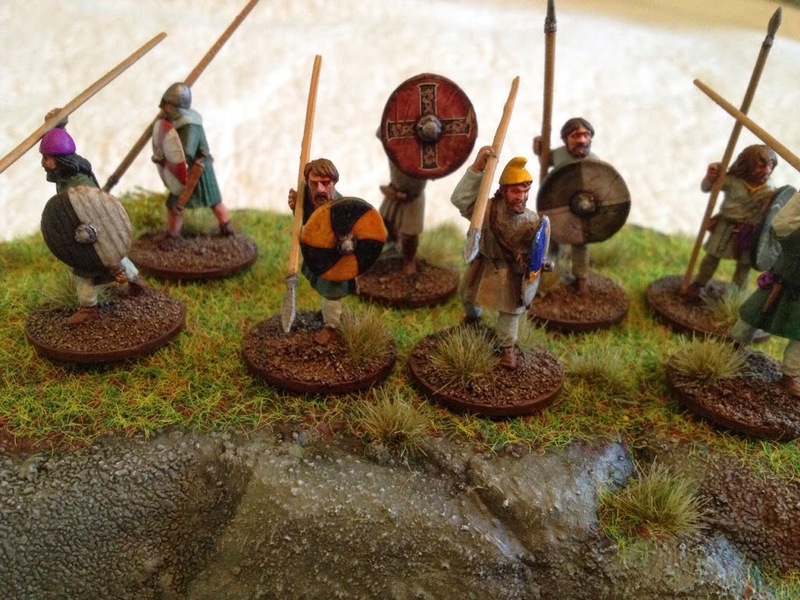 Well, I also managed to finish painting and varnishing the Anglo Dane Ceorls that were previously seen sat on my painting desk. Whilst I would like to take full credit for painting the shields, I'm not really very good at shield painting. The shields are all courtesy of Little Big Men. The trick with these transfers if good preparation. The shields should first be painted white for the colours on the transfers to shine through. I also found that painting a dark shade around the shield boss really helped. After the transfer is applied (a process that can be a bit fidly with some of the more domed shields), the edges of the shield are painted to blend in with the design. A light wash of Devlan Mud helps to give them a worn look (and hopefully helps mask my poor colour choices when blending).